Playgrounds and ball fields are available at Miller Park is located at 141 Crestview Drive, Utica OH . Additional athletic fields are located at South End Park on Blacksnake Rd. 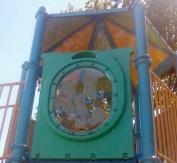 Utica Elementary School also has a playground area.